The Great Fair of 1814 allowed Londoners to celebrate the end of the war with France. The entertainment included games booths, swings and roundabouts, cake and apple stalls and military bands. The highlight was a naval re-enactment of the Battle of Trafalgar on the Serpentine, complete with guns firing at 'French' ships, which slowly sunk to the sound of national anthem. 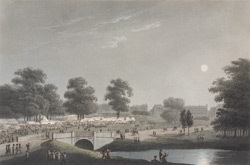 The fair was not universally popular; one local resident complaining that the "stench of liquors, bad tobacco, dirty people and provisions" was polluting the air around the park.